I have been in the industry for 10 years now and every year I still get excited for the weekend in April where all of our fitness friends get together and get to experience all the hype happening in the industry. For die hard fitness fanatics, regular gym goers and even people who are just entering the fitness industry there is something for everyone. The moment you enter into the health and fitness expo the vibe is pumping; people everywhere, music thumping, different brands and products wherever you look; it is literally like a carnival for the fit. The expo was split into three section, Industry, Active and Strength. Starting from the industry side, there is all the information a personal trainer running a business or a gym would want to know. Including the most advanced technology, apps and online planners. There was no doubt something that would enhance your business and create a better structure to run the business aspects smoothly. Not to mention the equipment companies displaying their latest and greatest training apparatus. Everything from heavy weight machines, free weights, cardiovascular equipment and new innovative functional tools were there to play with. You cannot help but get caught up in the new designs and you can spend hours just trying them all out. My favourite section is definitely the active section, which was where most of the educational companies were located. These stands range from rehabilitation, corrective exercise, new courses for trainers, and this is where you get to meet some of your science idols. For me, meeting Thomas Myers, who wrote the book Anatomy Trains, was the highlight of my weekend. Once you’ve even explored half of the expo, you are generally so overwhelmed by all the information that is out there that you start thinking our industry is endless, and it is. Which is great, it gives us access to so many new and exciting things to play with, learn and grow. At this point, from all the excitement, you will no doubt you become peckish. 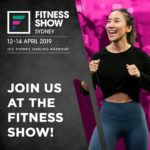 As you walk into the middle session of the expo there are free samples of protein bars, paleo food, coconut ice-cream, probiotic drinks and lots of other healthy snacks. If you’re looking for something more, the ICC (Sydney International Conference Centre) had a decent and pretty healthy food choice for you to buy. Mainly focused in the Strength section, but also spread throughout the arena, are numerous workout sections all displaying their specialty. You have the weightlifting area, a replica of Bondi’s muscle beach, a CrossFit area, group fitness arena and a Spartans area. You get to stand back and watch some of the world’s best fitness athletes lift heavy objects, flip/tumble/weave their bodies; their fitness levels will just blow you away. Along with all that, there are numerous clothing brands and supplement companies selling the latest products to help train in, and repair your hard worked muscles. There was also an area where you can sit down and enjoy hours and hours of watching keynote speakers and the body building and fitness competitions with ICN. The whole venue is full of different people, but all with one interest in common, FITNESS. My experience of the Fitness Show is that, although I have been year in and year out, the excitement never dies down. Meeting new people in the industry, meeting your Instagram idols; girls and guys, buying new gym gear and new health products, all whilst learning and meeting some of the most intelligent lectures and physiologists in the world. It is beyond one of the best weekends of the year. 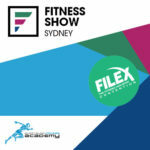 If you’ve never been, you should definitely try to get to the Sydney Fitness Show!